We work with our customers so that they can make the right decisions quickly with INSIGHT™. Using proven Extract, Transform and Load (ETL) processes from our ConversionSync™ service, the Bubblebox team ensures that data is available inside your preferred reporting application. This can be ad-hoc, scheduled or in real time – the choice is yours. Working in collaboration with you, we bring data from a variety of sources that are not natively available inside your CRM. These can include real-time browsing data on your website and GoogleAnalytics® information alongside engagement metrics from Marketing Cloud. Our approach provides our customers with the best data available, offering the opportunity for in-depth insight for business planning. Using key business understanding to inform decisions, we deliver relevant, timely and useful insights as your INSIGHT™ experts. 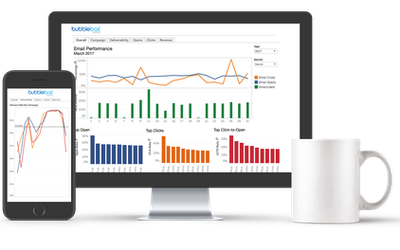 Interested in learning more about Bubblebox Insight™? Fill in the form below and we will be in touch.